An American Bible, 1912, bound in flexible leather, another variant! An American Bible, 1912, bound in flexible leather, and another variant! American Bible, 1912 full leather, gilt cover. Autology Another example with expanded description and pictures. The Book of The Roycrofters. 1926 leather bound. The Closed or Open Shop - Which? The Dipsy Chanty #51 of 100 with Sterling silver corners. The Elbert Hubbard I Knew, 2 variants bindings with and without errata. The Feather Duster, or Is He Sincere? The Holly Tree, 3/4 tooled leather. I Am Not Afraid, Are You? The Liberators, 1915, bound in 3/4 leather with marbled paper over boards. Variant not listed in McKenna. Liberators, 1919, paper over boards leatherette spine. Man of Sorrows, Harry Avery binding. Man of Sorrows, paper over boards. Message to Garcia. 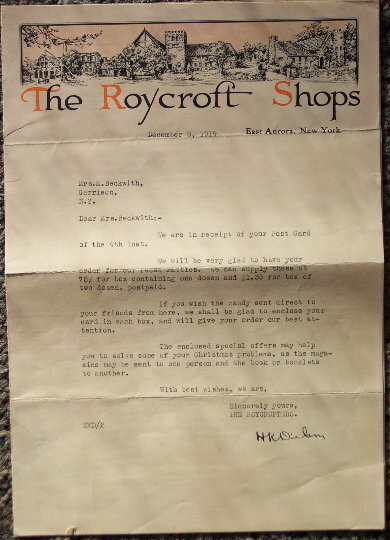 2nd Smallest Roycroft Book. Pig Pen Pete, original green pig skin hilighted in white. Pig Pen Pete, original green pigskin highlighted in gold. The Rubaiyat, full Levant, Charles Younger binding, not in McKenna. 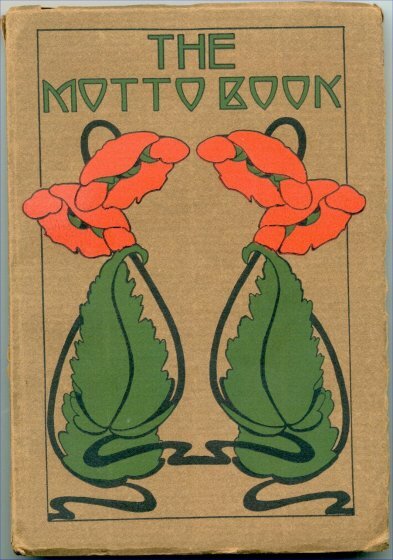 The Rubaiyat, 1926, Another Variant not in McKenna. Self Reliance - 1905, 3/4 Levant #4 of 100. With Raymond Riordon tie in. The Way of the Transgressor, variant binding. Will O' the Mill, bound in paper over boards. Variant not in McKenna. Will O' The Mill, bound in suede. Ye Ancient Mariner, Edition of 400, extra illuminated with original box. From Workshop to Wearer, A Little Journey to Baird North Co.
Watch Wisdom not in McKenna? What is the Matter With This Country? Dard Hunter Prints of The Roycroft Inn, On a variant paper. Elbert & Alice Hubbard Picture. Last Photo together.